As lightning licked around the North London skies, the two teams took to the soggy Spurs Lodge pitch that had been wetted by a heavy downpour. Spurs fielded a pretty strong side with some of their players having had reserve team experience - Lee Barnard, Steven Kelly, Ben Bowditch, Ronnie Henry and Paul O'Donaghue. On the other side, Andrew Burke made his return to Tottenham after leaving last season, as did Clayton Fortune, who was a non-playing attendee. There was a tentative start and both sides probed each others midfield, but the opening goal wasn't long in coming when John Sutton seized on a fluffed clearance. It was intended that the ball should have gone away and across the box, but it went a couple of feet to Sutton stationed by the penalty spot. He only had to stroke it past the out of position keeper to give Spurs a seventh minute lead. The mistake had been made by the Bristol City defender Simpson. DOH !! Spurs had a fair bit of possession, but it was not the day for them to string many passes together and the service into the forwards was not great, so there were few clear cut chances for them to take advantage of. Snee had a good drive saved, but apart from that Palmer in the City goal was relatively untroubled. The Bristol side started to edge their way forward and although they had some good moves, they lacked penetration. That was until about ten minutes before half-time, when a low drive from the edge of the box by Burke caught Rob Burch out at his right hand post and sneaked in. The goal was greeted loudly by a middle aged gent, who turned out to be the player's father !! At half-time the match was evenly matched, but the visitors had been emerging as the dominant side. Shortly into the second half, they took the lead, when Darren Hawkins was allowed a free header in the six-yard box from a corner and it was 1-2. 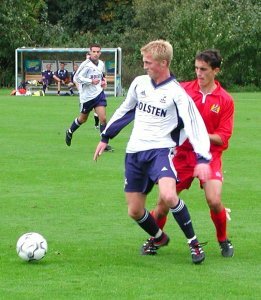 Spurs were being bossed in midfield, where Shanahan was pulling the strings for Bristol. Their short passing game was opening holes in the Tottenham side and a third came, surprisingly from a long ball, which was misjudged by Ronnie Henry, leaving captain Marvin Brown to slot past Burch from inside the area. Sensing their superiority, City pressed onward and Burch was called on to make three sharp saves from Pike, Blake and Brown. At the other end, Spurs had some good opportunities to break away, but they amounted to nothing. Dean Marney was trying to initiate some forward momentum, but apart from a Galbraith shot that was pushed wide by the keeper, there was little direct threat on the Robins' goal. Spurs took Sutton off and brought Vedeux on to try and spice the line-up up a bit. He ran more directly at the City defence than anyone else, but they stood firm and he could not find any way through. It was with about 8 minutes left that the final goal was scored and it came at the wrong end as far as Tottenham were concerned. Another corner, another free header and another goal for Brown. As the game petered out, Tottenham were under pressure again. The Bristol City side were much more mobile and their passing was more incisive and accurate. The scoreline may have flattered them a bit, but they were well worth their win, against a Spurs side that looked a little lacklustre. After a run of four games unbeaten, this was a little disappointing. There were a few famous faces around. Peter Suddaby, the Academy Director looked on from the touchline and former Spurs youth and reserve player David Lee had made it down from Hull, where he had found the cheapness of the saveloys to his liking !! I chatted to club historian Andy Porter during the match and we swapped tales of games past !! Despite waiting an hour for it to start (as I had turned up for the usual kick-off time of 11, not knowing it had been put back to noon as the City side travelled up that morning) it was a good game. TOTTENHAM : - Burch; J. Lee, S. Kelly, Henry, O'Donoghue; Bowditch, Marney, Snee, Galbraith; Sutton (Vedeux), Barnard. Unused subs : - Jalal, Gardner, Black, Thomas. BRISTOL CITY : - Palmer; Simpson, Woodman, Rosenior, Blake; Shanahan, Hawkins, Burke, Brown; Pike, Edwards.